Small-car sales have been in a downward spiral for quite a few years now. In Canada, consumers are trading in their compact cars for small SUVs, while subcompact car drivers and moving up to compacts. The minicar segment is also hurting, which includes the Nissan Micra, the Chevrolet Spark, the Fiat 500, the Mitsubishi Mirage and the smart fortwo. And yet, despite an 11% drop in sales in 2017 compared to 2016, the Micra keeps outselling all of its rivals combined. For that, Nissan can thank the Quebec market. La Belle Province alone picks up almost half of the country’s minicar sales, but in the Micra’s case, it’s more like 55%. Yes, Quebec’s population loves small cars, by choice, by financial restrictions—or both. However, as we’ve said before, the 2017 Nissan Micra is a fun car to drive, and has a cheery face, which also contribute to its popularity. The automaker is also investing heavily in marketing campaigns for the little hatchback, and has recently announced that the Micra Cup race series will continue for at least through 2020. That announcement means the Micra won’t get any major changes for the next three years in Canada, despite the fact that a brand-new generation of the minicar appeared in Europe last year. Nissan clearly wants us to embrace the old Micra and its sub-$10K price tag for a few more years. And why shouldn’t we? 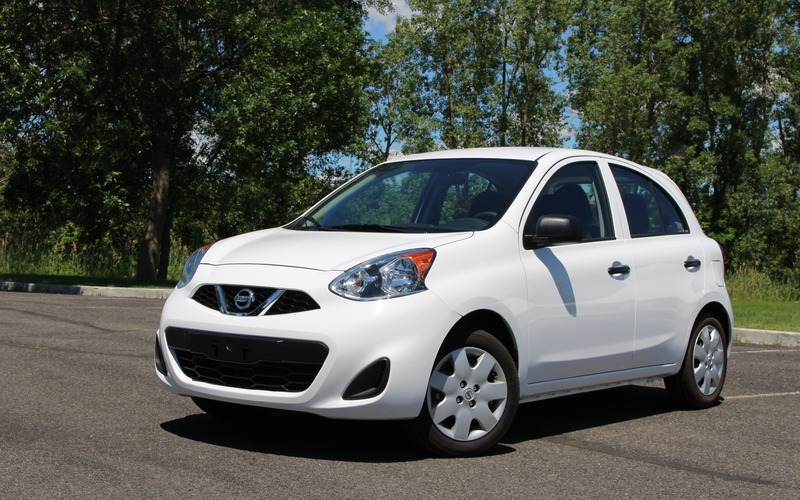 The 2017 Nissan Micra retails for $9,988 before freight and delivery charges. It’s the most affordable car in Canada, beating out the Spark by seven bucks. However, for that price, we get a bare-bones car with features our young kids may have never seen in their lives, such as roll-it-up-yourself windows and reach-in-and-pull-up-the-tab-yourself door locks. It also means that each time we park the Micra, we must remember to lock each door individually, and make sure the hatchback is locked, too. We feel dirt poor not having a keyfob, but we do get more exercise with this rudimentary procedure. There’s also no air conditioning, which didn’t seem all that important until we hit a heat wave during our two-week-long road test. Forget about arriving at your destination unruffled and dry. The base sound system doesn’t include Bluetooth connectivity, so you’ll need one of those hook-on earpieces that looked really cool for about two months in 2005. At least we could listen to our old Mötley Crüe CDs, although the four speakers sound all that great. It must be said that that every version of the Chevrolet Spark includes a seven-inch touchscreen, Bluetooth, Apple CarPlay and Android Auto integration as well as a rearview camera. Even the one that sells for $9,995. From a technological standpoint, that should be enough to convince the younger crowed that the Spark is a better choice. And yet the Micra still continues to outsell it by a two-to-one margin. Under the cookie-sheet sized hood of the 2017 Nissan Micra sits a 1.6-litre, four-cylinder engine that develops 109 horsepower and 107 pound-feet of torque. It can be paired to a five-speed manual or a four-speed automatic, and in both cases, power is sufficient to make the car enjoyable. We managed a fuel economy average of 6.1 L/100 km, but the Micra is one of the least fuel-efficient cars in its segment. The Micra isn’t fun because it’s fast—it isn’t by today’s standards. However, exploiting the manual gearbox is fun, there’s a good amount of torque to squirt through traffic, and the car’s sheer size gives it the agility to put a smile on our face. Just imagine yourself flogging this car at 9/10ths of its potential without being a reckless driver or going over the speed limit. Fun, and safe. Well, safe is a relative term here. The Micra does have six airbags and a stability control system, but we can’t get blind spot monitoring, lane departure warning or forward collision warning—even as options. A rearview camera is included in the SR trim level, but starting in May 2018, all vehicles produced for the Canadian market will have to be equipped with a standard-issue camera. Nissan Canada didn’t want to tell us what they’ll do just yet to keep the car’s base price below $10K when the 2018 model comes out, but they have a plan. Also not available are heated front seats, a big disadvantage for staying warm during our Canadian winters. All those features we complained about not having earlier can be added by stepping up to the SV and SR trim levels. The SV offers the best value with Bluetooth connectivity, keyless entry, A/C and power windows. However, this jacks up the price to $14,048—add another grand for an automatic transmission. 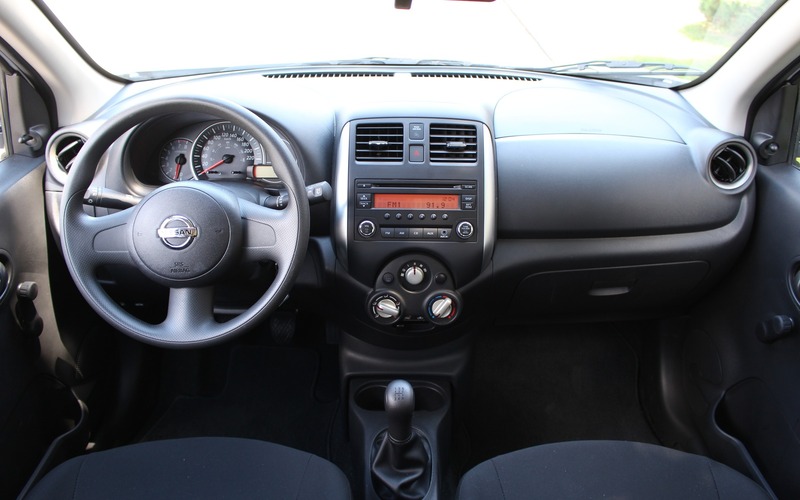 The Nissan Versa Note offers almost all those amenities for just a few hundred dollars more, and is more spacious, too. So the 2017 Nissan Micra isn’t the most fuel efficient car in its class. It isn’t the most spacious. It offers the least features, either standard or optional. It drives great around town, but gets noisy on the highway. Why is it so popular, then? It attracts buyers by its combination of style, performance, low price and reliable simplicity. 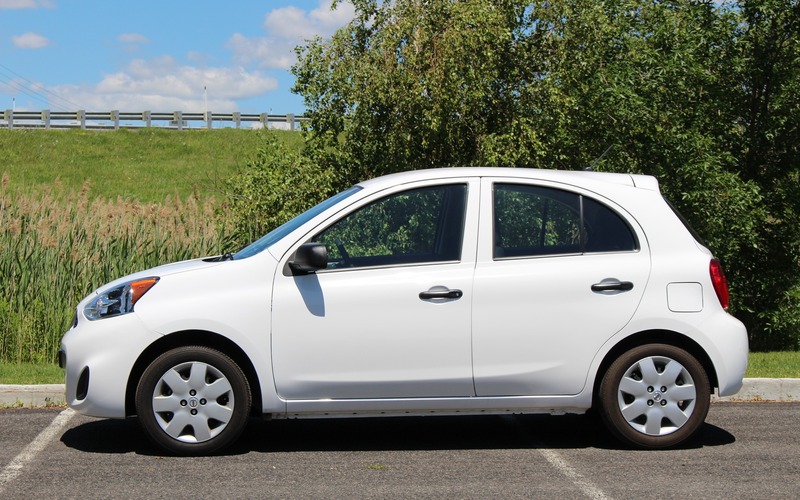 Simply put, going from A to Z in a new car is cheap—and fun—in the Micra. 7/10	We recorded a good fuel economy average, but the Micra isn’t the most efficient in its class. 6/10	The front seats aren’t supportive enough for long drives. 7/10	The biggest engine in its class, so performance is good. 4/10	The higher-end trim levels get a better system, but the base stereo is underwhelming. 8/10	Fun to drive due to its nimbleness, great manual gearbox and well-calibrated steering. 7/10	Way more interesting behind the wheel than on paper.